The EPA recently issued revisions to 40 CFR Part 370 that will affect reporting under Sections 311 and 312 of the Emergency Planning and Community Right to Know Act (EPCRA) for the 2017 calendar year. The revisions are intended to better align EPCRA with the revised OSHA Hazard Communication Standard (HCS) and facilitate safer management of hazardous materials. Let’s review the changes and how they may affect you. Additionally, all references to “MSDSs” in the EPCRA regulations are being updated to references to “SDSs,” which establishes consistency with GHS and the revised HCS. The revisions will lead to better management of chemicals and better integration of safety and environmental programs at affected facilities. This final rule was issued on June 13, 2016 and will become effective on January 1, 2018. This means that when facilities submit their Tier II reports by March 1, 2018 for the 2017 calendar year, they will need to use the new EPCRA hazard categories on their report forms. Revised forms containing the all of the HCS hazards will be made available through the EPA website and on individual state-specific EPA websites. Some states may already require facilities to report their hazardous chemicals using the revised physical and health hazards. Check with your state for specific reporting requirements. For now, just be aware that the changes have been made. Between now and the beginning of 2018, you will need to obtain revised Tier II forms for completing the reports for the 2017 calendar year. These will be made available via the EPA website and state environmental agency websites in time for the deadline. 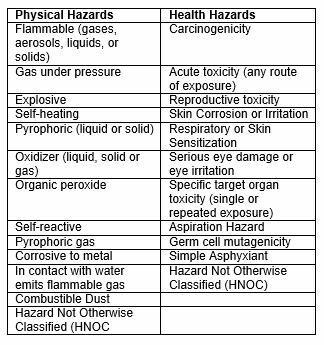 You may also want to make sure you have current, GHS-compliant SDSs on hand for your chemicals, and to familiarize yourself with the hazard classifications for them listed in Section 2 of the SDSs. Additionally, you should know that EPA will be updating “Tier2 Submit,” the software developed by the EPA for Tier II reporting, to include the new physical and health hazards adopted by OSHA the HCS – this will also happen in time for submission of the 2017 reports by March 1, 2018. In cases where states have developed their own Tier II reporting software, the EPA is allowing them to modify it to align with the final rule and make the new software available by January 1, 2018. EPCRA was first issued in 1986, in the wake of growing concerns about chemical emergencies like the December 1984 Bhopal disaster, in which over 500,000 people were exposed to methyl isocyanate gas from a gas leak, and thousands died. EPCRA required facilities that stored certain quantities of chemicals to submit information that would facilitate safe response during emergencies. Section 311 of EPCRA requires facilities to submit Safety Data Sheets (SDSs) for all hazardous materials stored at or above threshold planning quantities (TPQs) to their State Emergency Response Commission (SERC), their Local Emergency Planning Committee (LEPC), and the local fire departments. Section 312 requires facilities that exceed TPQs to submit a hazardous chemical inventory form (commonly called a “Tier II report”) to the SERC, LEPC and local fire department by March 1 of each year. 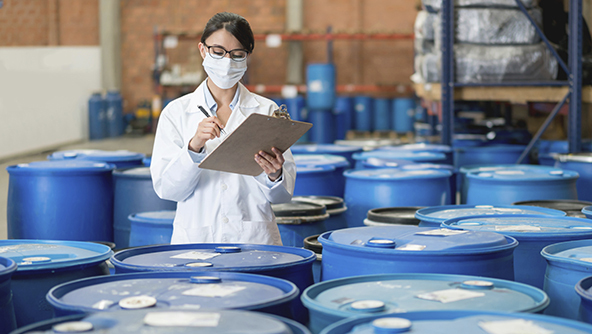 Facilities that store chemicals classified as Extremely Hazardous Substances (EHSs) trigger the above two requirements at lower quantities of chemical storage, based on the individual thresholds for chemicals on the published list of EHS materials. What makes a chemical “hazardous” for purposes of EPCRA? The EPA’s EPCRA regulations define hazardous substances as “substances for which a facility must maintain an SDS (formerly an MSDS) under the OSHA Hazard Communication Standard.” In 40 CFR 370.66, the EPA designates the health and physical hazards that should be used to describe the reportable chemicals for a facility. There were originally five EPCRA hazard categories (three physical and two health) that summarized the hazard categories identified by OSHA in the HCS. Thus, there was an intended alignment between EPCRA and OSHA, in which OSHA’s hazard classifications provided the basic framework for identifying chemical hazards under Sections 311 and 312 of EPCRA, but the alignment was not exact because EPA did not adopt OSHA’s categories exactly as written in its HCS. The correlation between EPCRA and HCS hazard categories weakened after March 26, 2012, when OSHA revised the HCS to align to the United Nations’ Globally Harmonized System (GHS) of Classification of Labelling of Chemicals. The intent of GHS is to replace conflicting chemical hazard communication systems in use by agencies and nations around the world for identifying and communicating hazards, with a single system, so that employees worldwide can receive the same information the same way, better enabling them to understand the hazards of the chemicals in their workplace. To align with GHS and what are essentially agreed-upon best practice approaches for hazard communication, OSHA revised its definition of a hazardous chemical and incorporated hazard chemical classification and category information from Revision 3 of the GHS. In doing so, it changed how chemicals were evaluated, defined and communicated. After the HCS revisions, many people began requesting that the EPA modify the EPCRA physical and hazard classes to match the changes. They reasoned that establishing harmony between the hazard classes used by EPCRA and HCS would facilitate reporting by allowing the person completing the report to simply copy the chemical hazard information from the SDS. Additionally, agencies responsible for receiving and reviewing Tier II reports would be able to compare the chemical hazard information listed on the SDSs with the hazard information included on the reports. The revisions in the final rule are therefore intended to avoid potential confusion and lead to more efficient reviews. Compliance with EPCRA reporting depends upon effective management of chemical inventory and timely, accurate fulfilment of reporting obligations. A versatile chemical management solution that stores and organizes SDSs for your chemicals, tracks the status and use of materials in your inventory, and facilitates generation of Tier II forms, can help streamline your EPCRA reporting tasks. Additionally, it can provide a visual representation of storage practices in your facility that can be easily shared via the innovative Plan1 service with local emergency response agencies, helping to better safeguard your workers, your facility, and your community. Call us today at 1.888.362.2007 to learn how our cloud-based, mobile-enabled solutions can help you maintain compliance with EPA and OSHA regulatory changes resulting from GHS alignment.